The PINGKO Walking Pedometer helps you to track your activity throughout the day and achieve your fitness goals. You will soon see how your steps add up while also encouraging you to do more, walk further each day and set bigger goals. Features advanced tri-axis silent walk sensor technology so that you can attach the pedometer to anywhere comfortable - clip to your hip, inside a pocket, bag or purse using the detachable strong clip and strap so you can forget about it while it accurately monitors your daily activity. Walk Sensor technology - to avoid counting sudden movements as steps, the counter will not count any movement less than 10 consecutive steps. Measure the daily steps taken, count calories burned, track distance walked in miles or kilometres. Plus Activity Time shows your daily active time while walking. Includes an automatic 7 day memory so you can keep motivated and track your progress. The pedometer also automatically resets at midnight so you can easily track your daily steps, distance and activity. 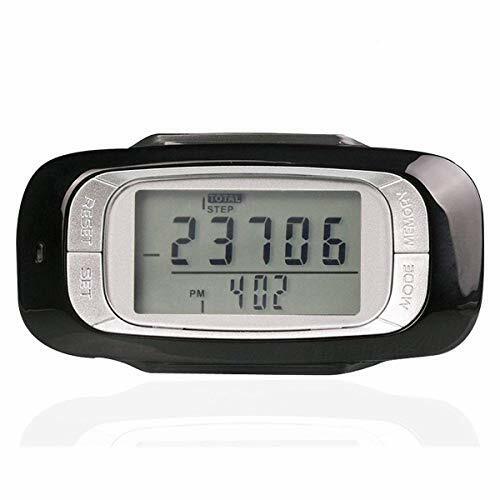 Set your daily step target and the pedometer displays a progress bar for easy viewing with a LED and beep indicator when you reach your daily target. 7 days memory, recall pedometer activities up to 7 days. Notice:Please make sure when using it the pedometer is has the buttons facing the ground. If you clip it on you side ways or upside down it will not count anything.